I love fairy gardens! It fits right in with my love of dollhouses and miniatures! I am trying to put together a couple for my garden. They are all works in progress. I had a cute little succulent garden in a pot that a dear friend gave me a couple of years ago. I had just set it on top of one of the planters out by my front door and it stayed there for almost two years. I finally took it apart to make fairy gardens with the plants in it. The first one isn't really a fairy garden per say, but if I could find a fairy or two, it could be! I used an old water fountain that the motor had seized up and was destined for the recycle bin. 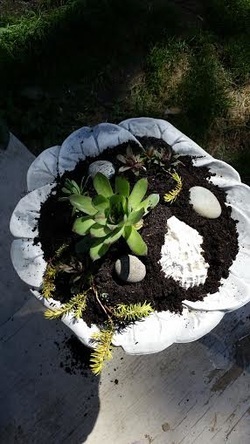 The second one I made using a birdbath, succulents and a shell I found. It's not exactly how I envisioned it, but I can add to it if I want. The third one I made is in a plastic toolbox that apparently belongs(ed) to our son, Dirk. OOPS! :) This one is, again a succulent garden. When I transplanted it from the original planter, I seriously thought I had killed it! It went all limp and brown. I was a tad bit more than ticked at myself, but I watered it really well and gave it some miracle grow a time or two and what do you know- it has bounced back and is thriving in spite of me!!! 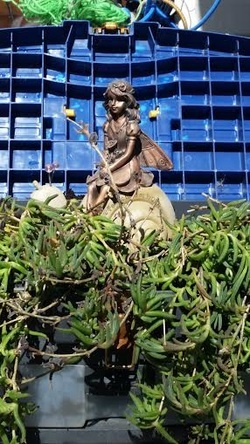 This garden does have a garden fairy in it! It was a gift several years ago from one of my sons and has been sitting in the house on a shelf. I think she looks much happier in her toolbox garden! I am working on another garden, this time in a vintage enamel dishpan that has moved around with us from pillar to post. It has the two leftover pieces of succulents from the original pot, and although the one has survived the replanting, I'm not too sure about the other one. I am hoping that with time, it will recover. There isn't anything else in it yet. I am searching for just the right fairy to live in this one! I will keep you posted on it's progress! I would love to hear about your adventures in fairy gardening! Any suggestions for ideas will be greatly appreciated! !